To Americans, anybody on our sceptred Isle is a Brit ( or a limey depending on how much has been drunk) To a Brit, we are either Scottish ,Welsh, Irish or best of all English. ... .................and be mighty proud about it without being branded a small minded "racist?" Little Englander, standing on the ramparts bellowing at the migrant hordes. Sure he was a Roman Soldier with a bit of a Christian leaning...but we all know him as the guy who slew the Dragon and undid the ropes on the screaming maiden. How the fire breathing reptile (in roman times ?) had managed to tie up a fair maiden, and why, was lost on my pedantic school boy mind...but he seemed a shiny suited, brave chivalrous knight in all the pictures, so he'd do for us. 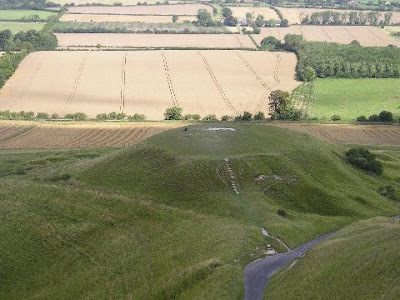 Actually a small mythical aside to all that, is, the spot he supposedly killed the dragon is in my county of Oxfordshire at the base of the ancient White Horse Hill in Uffington, with the small patch of chalk on its summit, where the blood was spilt and the grass wouldn't grow. Another fine local legend. 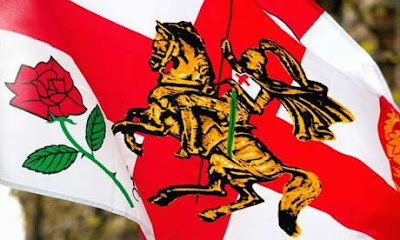 With the UK in the last 12 years being governed by New Labour, which is basically a Scottish cabal run by Tony Blair and Gordon Brown and all their Scottish friends, The notion of St Georges Day and being English was frowned apon. While the Celtic Scots, Irish, and Welsh were encouraged to get drunk at huge events to st. Andrew, st. Patrick and st. David, on their Days, respectively, The English were marginalized and made to think European, the flag denied being flown in favour of the horrid Euro Flag, till its last stand was only at Wembley Stadium in London in support of the National Soccer team. With the new dawn of Global Protectionism, and the effective end of New Labour , yesterday, with the Treasury Report speech in Parliament, a new patriotic zip is in the step of the rose wearing Englishman, and you can feel a whole new national pride emerging in the face of being all but Bankrupt. St George Flags are gradually appearing proudly on houses, overriding the fact that the fascist British National Party also appropriated it for a while, tarnishing its image. Of course Englishmen have a far better reason for celebrating the 23rd of April, and that is because it is the Birthday of the greatest of Englishmen, William Shakespeare. And...better still, Will did something i always think would be a pretty neat trick to do myself, ( in my warped sense of humor way ) and that was he Died on April 23rd too.. His Birthday!!! Way to Go William!!! As the Great Man probably meant to write.... "To beer or Not To beer, that is the question" To which I answer " Yes I will, By England and St George, I will !!" Screw the Celts! Oh, that's right...I do already...sorry me lady! 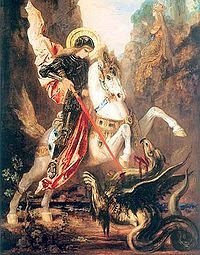 Anyway, wave the St. George Flag proudly today mates! You have nothing to be ashamed of! Happy Birthday Will and May God Save the Queen and England! Did not know that Shakespeare died on his birthday. That has a nice bit of symmetry to it! And as to the question, "to beer or not to beer? ", yes, I believe I will, too! Interesting Blog, even to a German Kuhn. 1. Ingrid Bergman was born on August 29, 1915, in Stockholm, Sweden, She died 67 years later in 1982 in London after battling breast cancer (the official cause of death was lymphoma complications that came after a breast cancer operation). 2. Betty Friedan, the author of The Feminine Mystique, was born on February 4, 1921, and died on the same day in 2006. She was 85 when she was claimed by congestive heart failure. 3. Walter Diemer, the inventor of bubble gum, went “pop!” on his 93rd birthday on January 8, 1998. I apologize for the bad pun. 4. George “Machine Gun Kelly” was gunned down by… um, a heart attack. Sorry, I guess I can’t turn all of them into stupid jokes. He was exactly 59 years old, dying on his July 17 birthday in 1954. Kelly was incarcerated at Leavenworth at the time. .......so i guess i like the idea of falling off the perch on the 21st of May...lol.... what would wrankle me would be carccing it a few days before my Birthday.. It's the perfect Circle of Life. That way my birthday would become my re-birth day! Perhaps there's something to it because my two near death experinces where on October 31, which by the way is All Saints Day, and July 31, which was the same day that Lady Allwinky's mother passed away. OK, so there is a connection. Watch out for High Fest Days, Anniversaries and 31's! Nothing like recycling that DNA!